So the carrot cake from Bake Sale bakery? Best store-bought cake I’ve ever had. Seriously. Most store-bought cakes have the same airy, vaguely processed texture that I find somewhat unappealing. Not this cake; this one is dense, moist, and very close to cake perfection. It has walnuts interspersed throughout, which add a satisfying textural component as well as a vague nuttiness that compliments the cake quite well. The cream cheese frosting is rich and sweet, but not overly so. It’s also really well proportioned, giving you a perfect amount of cake and frosting in each bite. It’s raisin-free, which I found delightful. Hey raisins: what’s the point of you? Go home. No one likes you. Look, it’s a classic carrot cake. They’re not reinventing the wheel here. 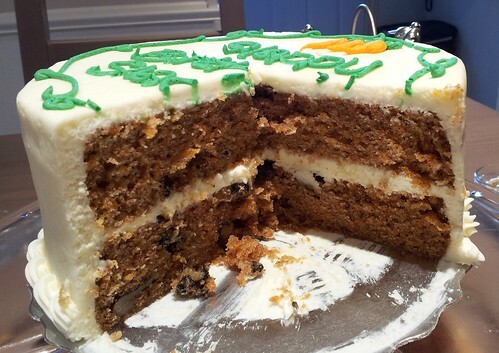 This isn’t someone’s take on a carrot cake; it is a carrot cake, executed to absolute perfection.